I’m sometimes asked to explain, in a general way, the main findings and discoveries from the long-term evolution experiment (LTEE) with E. coli. So in a series of ~10 posts, I will briefly summarize the most important findings and discoveries, as I see them, in very broad, conceptual terms. I won’t provide the detailed results, but I will list some of the key papers that present them. Interested readers can read those papers to see the methods, evidence, and data that support the findings and discoveries. For anyone seeking a general introduction to the LTEE and the advantages that this experimental system offers for studying evolution, I recommend reading the 1994 paper by Lenski and Travisano (cited below) before all others. Number 1. Although no one (excepting cranks, zealots, and the uninformed) doubts the fact that adaptation by natural selection occurs, the LTEE provides a simple and compelling demonstration of its power and efficacy. I’ve heard this point stated repeatedly after talks for the general public and even after seminars for other scientists. Lenski, R. E., M. R. Rose, S. C. Simpson, and S. C. Tadler. 1991. Long-term experimental evolution in Escherichia coli. I. Adaptation and divergence during 2,000 generations. American Naturalist 138: 1315-1341. 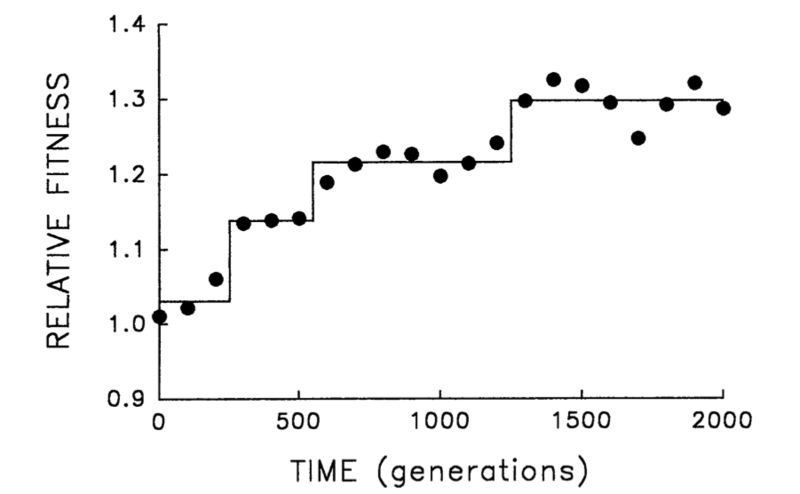 The figure below shows the step-like fitness trajectory measured for one of the LTEE populations over the course of the first 2,000 generations of the experiment. The figure comes from Lenski and Travisano, 1994, Proc. Natl. Acad. Sci. USA; it is shown here under the doctrine of fair use.